Emory organizes a prayer and reflection service and offers resources to those affected by the tragedy at the Boston Marathon, as well as safety reminders for the community. Emory Photo/Video. A time for reflection and prayer for those affected by the Boston Marathon tragedy has been set for Wednesday, April 17, at 11 a.m. in Asbury Circle. The Emory University community is invited to write prayers and offer messages of grief and hope. At noon, students will offer public prayers from various religious traditions. Thus far, no one connected to the Emory community has been found to be among the victims of the explosions that occurred Monday, April 15, at the finish line of the iconic race. "Please join us Wednesday, in Asbury Circle, to offer comfort to one another and to offer hope to Boston and the world," says Lisa Garvin, associate dean of the Chapel and Religious Life. On Tuesday morning, President James W. Wagner offered community members a message of condolence. 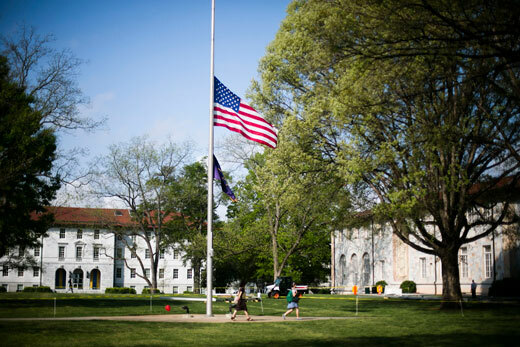 And the flag on the Quad was flown at half-staff to honor the victims of the Boston Marathon bombings. Images from the Boston bombings were eerily familiar to Alex Isakov, executive director for Emory's Office of Critical Event Preparedness and Response (CEPAR). Isakov had twice worked at the marathon's finish line during a fellowship with Boston's Emergency Medical Services. "I know that space intimately," he recalls. "They take the marathon very seriously and they take security very seriously. They have a level of preparedness that is superior to most, but no one relishes responding to an event like this — it always takes its toll." As the medical and law enforcement response continues to unfold, Isakov points out that "the recovery phase for those impacted, as well as those injured, is ongoing." "At Emory, there are resources for people who need to talk and process what they saw, heard and felt. Mental health counselors and others can help, from Student Health and Counseling Services and the Faculty Staff Assistance Program," he adds. Emory's Division of Campus Life has already been reaching out to students — particularly those from the Boston area — via email to let them know of campus resources. Emory's Office of Critical Event Preparedness and Response offers a reminder of the importance of reviewing basic safety measures that anyone can follow to contribute to "a better-prepared, more disaster-resilient community," says Isakov. "I think everybody has a role in that — not just professional responders, but as individuals," he adds. "This is an opportunity to reflect on what we can do as individuals to help, to think about having a personal plan of action." At Emory, a good place to start is by reviewing the "Just In Time" emergency guides and Preparedness Checklist that are available for both Emory's Atlanta and Oxford campuses, says Sam Shartar, CEPAR senior administrator. The online guides offer quick reference for emergency phone numbers and tips for how to handle incidents ranging from suspected hazardous devices or bomb threats, general evacuation procedures, campus violence or personal safety concerns. Enrolling in Emory's Emergency Notification System, which alerts students, staff, faculty and visitors of emergencies through a number of devices, including text messages, email, Twitter or Facebook. Be alert and aware of your surroundings. The community can play an important role by simply being vigilant. From a suspicious package or abandoned backpack to observing individuals in places where they shouldn't be, "if you see something that seems suspicious, that doesn't feel right to you, that doesn't fit in with the setting, call the police," Shartar says. "Trust that inner voice and make a phone call." Assess everyday surroundings — be it a dorm room, classroom or public space — and make a plan, imagining what you might do in the event of an actual incident. "Take terrorism out of it — it could be a summer thunderstorm that produces dangerous lightning, or a tornado. Do you know where you would go?" Shartar asks. Have an emergency communication plan with family, friends or co-workers. How will you connect? Do they have numbers to reach you? Be prepared. Consider enrolling in a basic First Aid or CPR class. Take appropriate actions for the emergency instructions provided. Those who feel the need to talk to someone are encouraged to contact Emory's Faculty Staff Assistance Program at 404-727-4328, Student Health and Counseling Services at 404-727-7450, or the Oxford College Counseling Center at 770-784-8376.